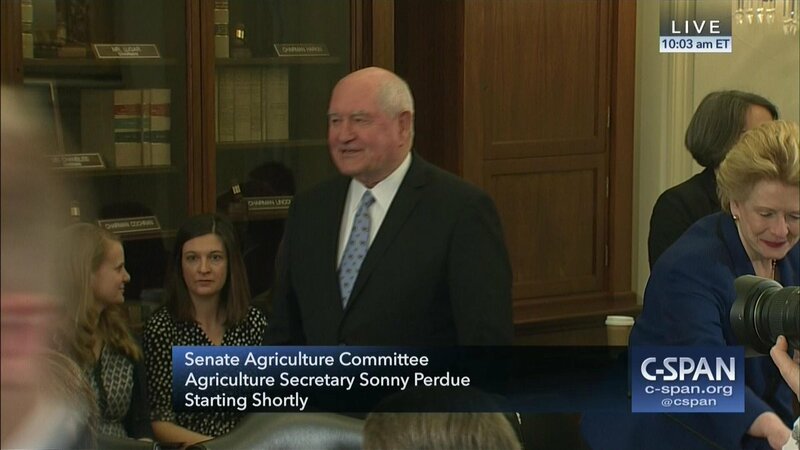 On the one-year anniversary of being confirmed by the Senate as the 31st U.S. Secretary of Agriculture, former Georgia Governor Sonny Perdue delivered testimony on Tuesday to the Senate Agriculture Committee at a hearing titled, “The State of Rural America.” Sec. Perdue was quizzed by Senators about a variety of issues, including trade and the Renewable Fuel Standard (RFS). In his opening remarks, Committee Chairman Pat Roberts (R., Kan.) noted that, “Producers in Kansas and all across the country are going through a rough patch in the agricultural economy. Over the past five years, prices for many of our major commodities have dropped by over 40 percent. As a result, net farm income is expected to decline by 52 percent. The ongoing pressure of low commodity prices continues the need for a high volume of sales. Now more than ever, producers need certainty and predictability – and a partner in government that can help steady the ship and right the course. On Tuesday, Secretary of Agriculture Sonny Perdue testified at a Senate Agriculture Committee hearing titled, “The State of Rural America.” (CSPAN PHOTO). Sec. Perdue reminded the Committee that President Trump had considered withdrawing from the North American Free Trade Agreement (NAFTA) late last April, right around the time he was confirmed as Secretary. Sec Perdue intervened by bringing a map into an Oval Office meeting demonstrating that agricultural areas would be hard particularly hard by this action. “And he relented, thankfully, in that. I’m hopeful that we will see a successful NAFTA conclusion here shortly,” Sec. Perdue noted. Sec. Perdue added, “But the administration knows full well. They’ve got a lot of support in the farm area. They want to be with them. But there is concern over their livelihood. And really, I think a legitimate anxiety that we’ve communicated to the President and to the cabinet. We’ve discussed, obviously, your proposal that we want trade and we want open new markets rather than aid. Chairman Roberts responded by saying, “The point I’d like to make is that in the realm of negotiation, any statement that is being made, even though it is not conclusive with regards to finalizing any negotiation, is market sensitive. I think you could even say that in some cases we’re using farmers, ranchers, growers as a pawn with regards to trying to get there from here on a better trade agreement. That’s pretty strong words. I don’t mean that in an accusatory fashion. That’s just the way it is. In response to a question from Sen. John Hoeven (R., N.D.), Sec. Perdue highlighted some points of success the executive branch has had in the area of agricultural trade, “We’ve had some success over the last year. Most notable, obviously, is beef back into China after 13 years. We just announced pork back into Argentina since 1992. In response to a question from Sen. Heidi Heitkamp (D. N.D.), Sec. 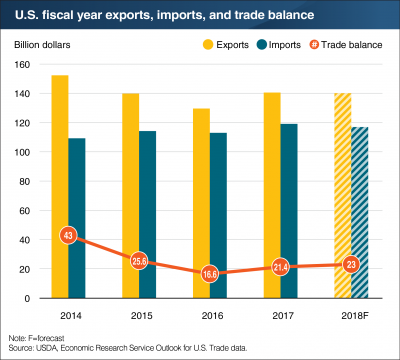 Perdue also highlighted the recent modifications to the U.S.-Republic of Korea Free Trade Agreement (KORUS). Sec. Perdue stated that, “We all are aware, the press has reported some of those authorities have to do with Section 32 and the CCC authority we’re given here. We’ve got to be very careful in how we administer that, though, because farmers, as you know, would rather have a fair price for a good crop than a government check. So we don’t want to set a precedent of an expectation that we can’t live up to. My economists tell me they have models that can tell them what is the impact of the specific trade disruption, and that’s what we want to account for, not just regular market forces. Meanwhile, Washington Post writer Erica Werner reported yesterday that, “Agriculture Secretary Sonny Perdue told senators Tuesday that he’s encouraging President Trump to consider rejoining the Trans-Pacific Partnership, the 11-nation trade deal the president pulled out of days after taking office. “Perdue’s comment is the latest mixed signal from the Trump administration over the TPP, which Trump recently told senators he’s open to rejoining, only to subsequently suggest over Twitter that he’s not. 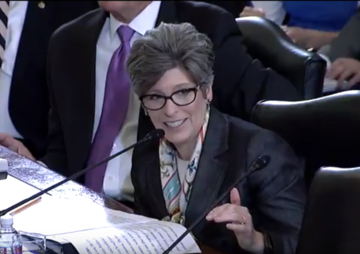 Sen. Joni Ernst (R., Iowa) questioned Agriculture Secretary Sonny Perdue on the agency’s efforts to protect the RFS, and the 88,000 farms across Iowa and 50,000 jobs tied to the renewable fuels industry (SEN. ERNST PRESS RELEASE PHOTO). 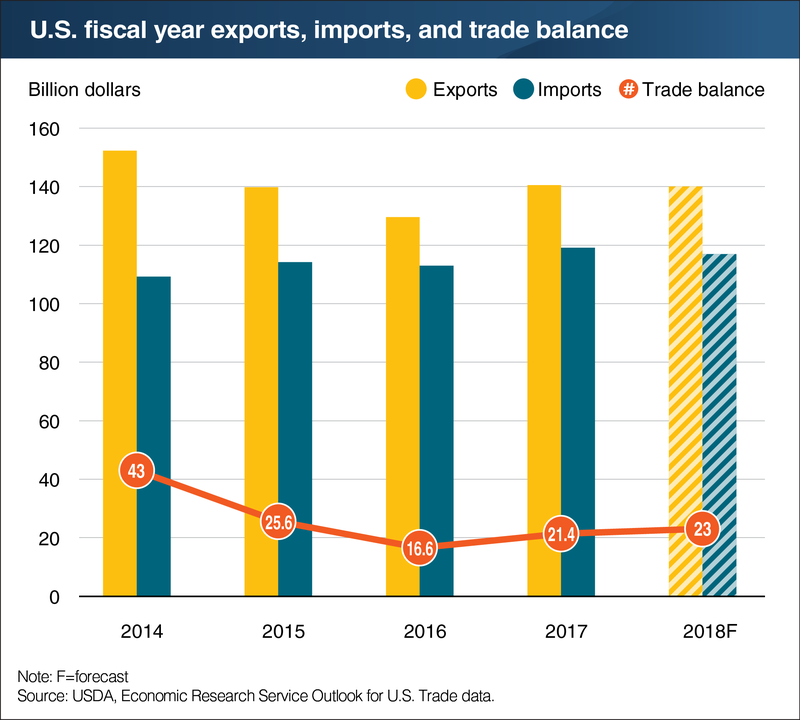 Last week, the U.S. Department of Agriculture updated its monthly agricultural trade data. Today's update includes an overview of some observations from the data with a focus on corn, soybeans, wheat and livestock.